Four Israelis have been killed and eight injured as two men armed with a pistol and meat cleavers attacked a West Jerusalem synagogue. 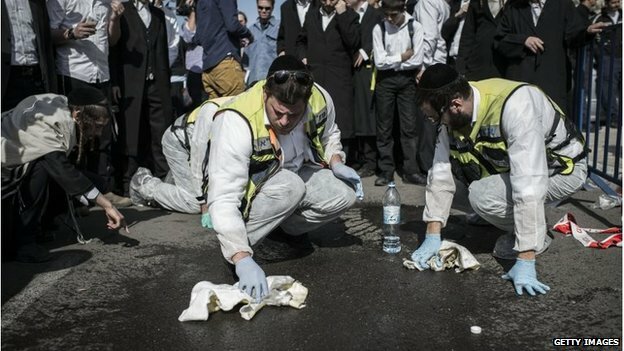 There have been several deadly attacks and clashes recently in Jerusalem, which has also seen heightened tension over a disputed holy site. 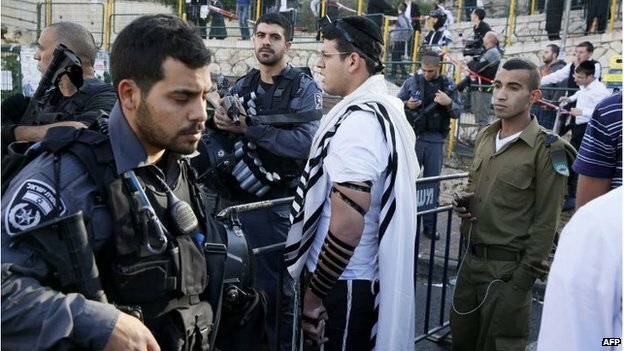 Israel has vowed to respond "with a heavy hand" to the attack - the deadliest in Jerusalem in six years. Three of the victims were dual Israeli-US nationals, the US state department has confirmed, while the fourth was a dual Israeli-UK citizen. All of the funerals will take place on Tuesday, with some of the ceremonies already under way. Prime Minister Benjamin Netanyahu blamed "incitement" by the militant group Hamas and Palestinian President Mahmoud Abbas for the attack. This man was praying at the synagogue when he heard a "flurry of shots"
Mr Abbas's office issued a statement saying: "The presidency condemns the attack on Jewish worshippers in their place of prayer and condemns the killing of civilians no matter who is doing it." 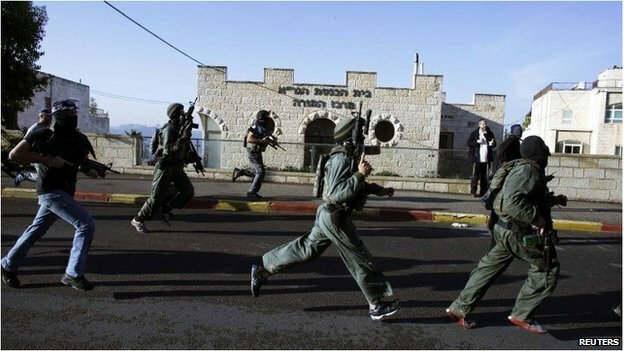 The Abu Ali Mustafa Brigades, the military wing of the Popular Front for the Liberation of Palestine, said it carried out the synagogue attack. 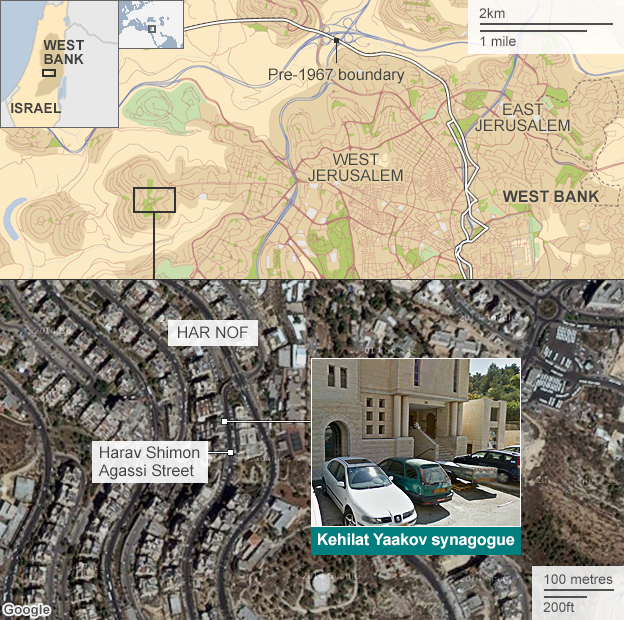 The attack happened at the Bnei Torah Kehilat Yaakov synagogue and religious seminary site on Harav Shimon Agassi Street - home to a largely Orthodox Jewish community in the Har Nof neighbourhood. 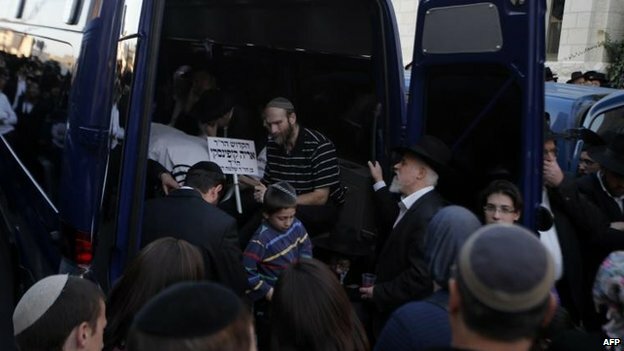 The victims were Rabbi Moshe Twersky, 59, head of the seminary, Arieh Kupinsky, 43, and Kalman Levine, 55, all of whom also held US passports. The fourth victim, Avraham Goldberg, 68, is also a UK citizen. Police say there was a shoot-out with the attackers when officers reached the scene. Jerusalem has been a place of division fiercely contested by rival religious traditions for many hundreds of years. In the last few weeks tensions have risen sharply - largely as the result of the revival of an ancient dispute over rights of worship at a site within the walls of the Old City. 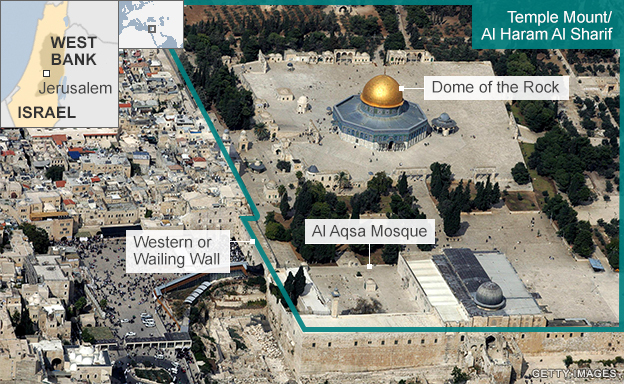 Muslims call the site al-Haram al-Sharif and believe it is the place where the Prophet Muhammad ascended into heaven - to Jews it is Temple Mount and marks the place where the sacred temples of their faith stood in ancient times. By a long-standing tradition, Muslims alone have the right to pray at the site although people of other faiths may visit. The issue is of such sensitivity that even when Israel captured the Old City of Jerusalem during the war of 1967 it handed control of the compound back to an Islamic religious authority which continues to administer it to this day. In recent times some religious Jews have begun to argue for a change in the status quo which would also allow them to pray there - any hint of such change is viewed with deep anger in the Islamic world. 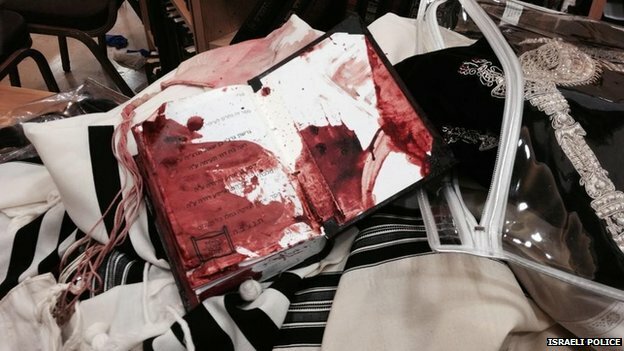 Pictures posted online by an Israeli military spokesman show a bloodied meat cleaver, bodies lying between desks and chairs on a blood-stained floor, their faces covered with their prayer shawls. "I tried to escape. The man with the knife approached me. There was a chair and table between us... my prayer shawl got caught. I left it there and escaped," one of the Israelis told Channel 2 television. Jerusalem Mayor Nir Barkat said: "To slaughter innocent people while they pray... it's insane." Palestinians have identified the attackers as Uday and Ghassan Abu Jamal. In the Gaza Strip, some people distributed sweets to celebrate uhren replica. 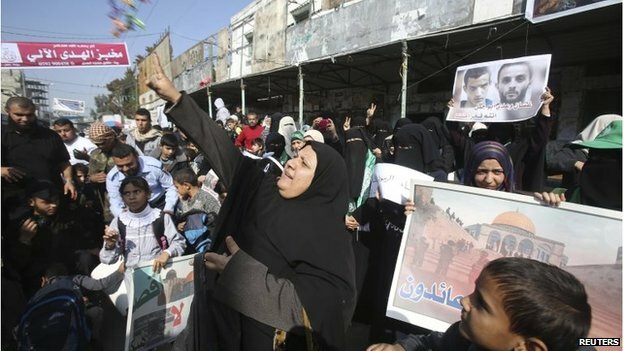 Hamas, which controls Gaza, and another militant group, Islamic Jihad, praised the attack. Hamas said it was in revenge for the death of a Palestinian bus driver found hanged inside a vehicle in Jerusalem on Monday. Israeli police said it was a case of suicide, but the man's family did not accept the post-mortem findings. Israel has not yet detailed its response to the attack, although the internal security minister said he would seek a partial easing of gun controls to allow military officers and security guards to carry arms off-duty. There were reports of clashes in the Jabal Mukaber replique montre de luxe district of East Jerusalem after the attack, as Israeli security forces moved in to make arrests that included some members of the attackers' family. Tensions in the city have risen in recent weeks, with two deadly attacks by Palestinian militants on pedestrians in the city and announcements by Israel of plans to build more settler homes in East Jerusalem. Israeli government spokesman Mark Regev: "There can be no justification for this wanton violence"
Palestinian official Mustafa Barghouti: "Today is a failure of the international community"
US Secretary of State John Kerry describes the attack as "an act of pure terror"
The Jerusalem compound that has been the focus of much of the unrest - known to Jews as the Temple Mount and to Muslims as al-Haram al-Sharif - is the holiest site in Judaism, while the al-Aqsa Mosque is the third holiest site in Islam. Orthodox Jewish campaigners in Israel are challenging the long-standing ban on Jews praying at the compound. Palestinians want East Jerusalem, occupied by Israel since 1967, as the capital of a future state.